Susana said I could make whatever I wanted for her Banzai Birthday treats. 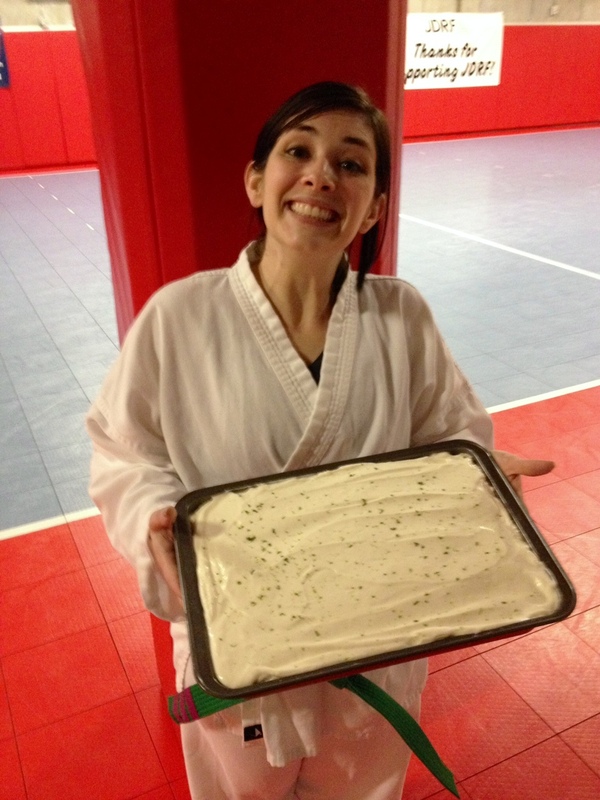 The desserts chosen most frequently for Karate Club contain chocolate and peanut butter. Don’t get me wrong – I LOVE chocolate and peanut butter! But not everyone loves chocolate, and I was in the mood for something different. And since it was spring, something lighter sounded good. This is a key lime cake topped with a silky key lime cream. Click for recipe. In my opinion, the topping is definitely the best part! I could have skipped the cake and eaten just that!! In fact, one of these days I might. The original recipe makes a 4-layer torte, but I knew that would be a travel disaster. Ditto for cupcakes, so I made it in a 9 x 13 pan. I mixed up the topping at home, but waited until I got to work to put it on the cake. Whipped cream would be tasty on this and would closely mirror authentic key lime pie, but it’s not necessary. This needs to be refrigerated, so keep that in mind when you make it. This is an easy, refreshing and very delicious cake that’s perfect for spring and summer! I also think the ingredients would make a delish trifle – layers of key lime cake, key lime cream, fresh strawberries and whipped cream. Yep, might have to give that one a try. Not only would it taste good, but the presentation would be spectacular and worthy of a celebration! Banzai to Susana – and thanks for letting me choose your birthday treats! Heat oven to 350F. Grease and flour 9×13 pan. In large bowl, combine all cake ingredients at low speed until moistened; scrape down bowl and beat 2 minutes at high speed. Pour batter in greased and floured pan. Bake at 350 for 30-40 minutes, or until toothpick inserted in center comes out clean. For topping, in small bowl, combine sweetened condensed milk and 1/2 cup key lime juice; mix well and set aside while whipping cream. In large bowl, beat whipping cream until stiff peaks form. Fold condensed milk mixture into remaining whipped cream just until blended. 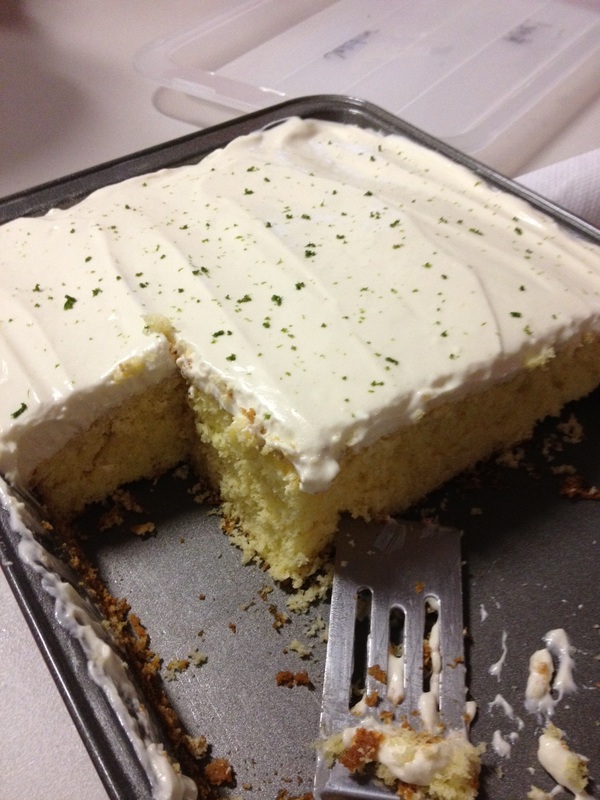 Spread key lime cream over cooled cake. Sprinkle lime zest over top, if using. Refrigerate 2-3 hours before serving. Store in refrigerator. 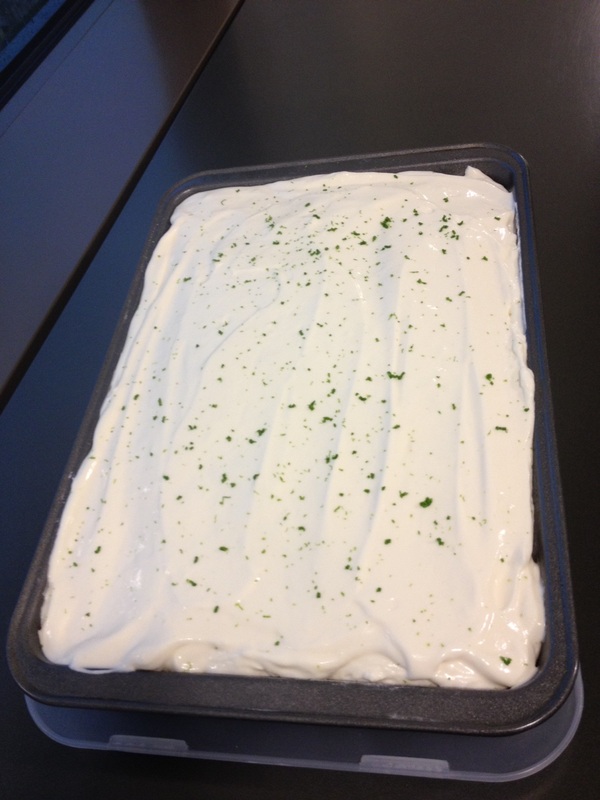 I was lucky enough to get to dip my finger in the key lime icing – wowza!!!! This is the perfect cake for the hot summer!! You’re a great taste-tester! I need to make this for our team.